Craigh na Dun or Castle Leoch may have been a figment of Outlander author Diana Gabaldon's imagination but this fascinating world of standing stones, romantic castles and sweeping scenery was inspired by real places and heritage. Not only that, the TV adaptation was filmed entirely on location in Scotland. 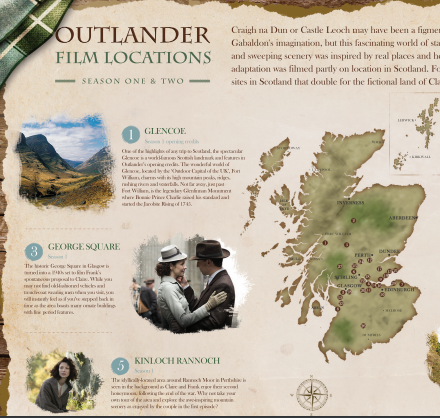 Follow this map and discover the sties in Scotland that double for the fictional land of Claire and Jamie.